Team Sahlen’s OVERALL Victory in Sunday’s 8 Hour enduro was incredibly a 7 lap margin over 2nd place. There was no practice or qualifying on held on Friday. The only activity was in the evening was Tech inspection for the race cars and a Driver’s meeting held. This meant no time to shake down the team’s Mazda RX7 and Porsche Cayman. The good news for Team Sahlen is that both cars had been on the chassis dyno as well as driven around the shop parking lot. Saturday dawned with overcast but dry skies. Team Sahlen took the green flag at 8:30 am and slowly worked their way through the pack. At the 2 hour mark, the #44 “Salt” Porsche Cayman was in 2nd overall and the #942 “Ketchup” Mazda RX7 was in 2nd in GP2 Class and 7th overall. At just about the 2 ½ hour mark though, “Ketchup” had a freak occurrence of the Transmission Casing breaking. #44 “Salt” continued to make progress, staying in 2nd place overall at the 4 ½ hour mark, when a lower control arm suddenly broke. Although the Cayman was able to be limped back to the pits, this time in the garage essentially erased any chance the team had of winning overall for the day. Sunday dawned with not only continued clear skies, but a bit higher temperatures than the day before. 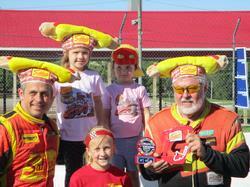 Team Sahlen continued a steady pace in both #44 “Salt” and #942 “Ketchup”. “Ketchup” was running a very steady pace that led to the Rotary Rocket rising up to 9th overall and 2nd in GP2. At the 5 ½ hour mark, a freak misfire led to a quick trip to the garage to diagnose. The top notch Team Sahlen crew conducted a very thorough but quick diagnosis to discover failed Fuel Injectors. Once replaced, “Ketchup” was back on the track in less than an hour. Continued steady race pace saw Joe Sahlen bring the Mazda home 14th overall and 3rd in the GP2 class. This result marked “Ketchup”’s 5th podium in three race weekends with World Racing League. #44 “Salt”, being driven by Joe & Wayne Nonnamaker, continued throughout the day to lay down consistently fast laps. The pace was not able to be matched by the competition. To add to the gap on the other racers, the Team Sahlen crew continued to execute excellent, swift pit stops. By the end of the day, the Team Sahlen Porsche Cayman had secured the OVERALL Victory by 7 laps, setting the fastest race lap of the day.